We have offered only two other plate blocks from the top position since keeping computerized records. Both were Mint N.H., but one has perforations touching the design. 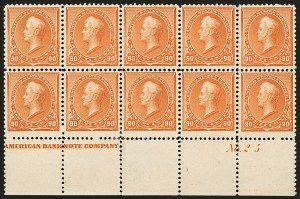 The other is a plate block of 16 with centering comparable to the one offered here. Wampler had one from the bottom position, and Dr. Fogelson did not have any. The Philatelic Foundation has not certified any other 6¢ 1890 plate blocks from the top position. An exhaustive review of our auctions since 1994 found only one other Mint N.H. plate block, from the bottom position. The Philatelic Foundation has certified one other as Mint N.H., from the bottom position. 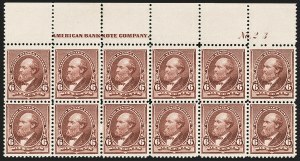 The 90¢ stamp printed by the American Bank Note Co. in 1890 was the last issue of this denomination. When the Columbian commemorative issue was produced in 1893, followed by the 1894 Bureau regular issue, the 90¢ was replaced by dollar values. The practical value of a 90¢ stamp was greatly diminished when the basic domestic letter rate was reduced from 3¢ to 2¢ in 1883. 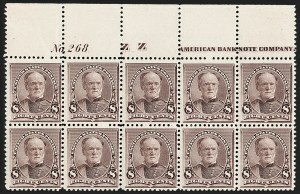 Plate 25 was the only plate used to print the 90¢ 1890 Issue. Plate blocks are exceedingly rare. Our 2014 Curtis auction contained two, and prior to that one has to go back to 2003 to find another offered in our auctions.